The time to design a userbar has come to an end. Now the community will have to decide which userbar will be featuring this years RaGEZONE awards. Note: Your account has to be atleast 1 year old in order to count for a vote, Voting with alt-accounts will be punished. Last edited by Ben; 29-11-16 at 04:46 PM. Voted for Jaximus, reason in other thread. Voted for Jax. Clean, sleek, and minimal! Good, you can see who's voting this time. Deux! I love Jax and his designs but can we avoid having the same basic concept design for a third year in a row? See my signature for details; current submission and the past two are strikingly similar. By the way, I actually expected FCV2005 to get a lot more votes than it has now. I am a bit disappointed it does look like someone had been messing with the votes. I can see all of the votes, and no one has messed with the votes. There are a few votes that are unknown to me, but most are colored names. Btw, I voted for jax's because it is smaller and cleaner. Although both are VERY nice. Thanks to both. 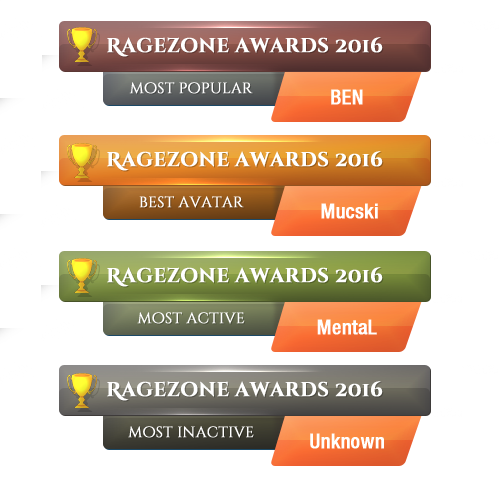 I think @Biesmen was talking about the previous vote here: Vote for the 2016 RaGEZONE Awards Userbar! when he said "it does look like someone had been messing with the votes". Anyw. now that I see Junkers awards, I agree that they look very similar to the last years designs. There were sadly only two submissions this year. Personally I just don't like the design of #1 and it looks like I'm not alone. We gotta play fair in the end.